Moulin Rouge – Dress up for a glamorous night on the town! We give you the chance to see a show at the infamous Moulin Rouge, well known for its French Can-Can as well as the hit movie musical named after it. The current show “Féerie” is comprised of 80 international performers, decked out in feathers, sequins, and rhinestones. It is worth going to this show just to view the 1,000 colorful, Parisian-made costumes designed by prestigious Italian artists! Dachau Concentration Camp- We provide an opportunity for you to tour Dachau, the first concentration camp established in Germany by Adolf Hitler. This institution was full of unimaginable suffering and fear for thousands of people during WWII. The main exhibition uses firsthand accounts, documents, and drawings to tell the stories of the prisoners who came to the camp, their life in the camp, and their journey to either death or liberation. Whitewater Rafting – Think that a break in the Austrian Alps might be boring? No way! There is so much to do there that you may not find time to do everything! While relaxing in the spa is an option, another option is whitewater rafting on the Enns River, located in the Austrian Alps, which can get up to Class 3 rapids! The Enns is the fifth largest body of water in Austria and one of the world’s most popular whitewater rafting destinations. If you want both an exciting challenge and to experience the breathtaking valley, gorges, and mountain ranges of Austria from a different perspective, whitewater rafting is the perfect way to do so! Tuscan Feast – Dress up for a fun night out enjoying a traditional Tuscan Feast! The restaurant we take you to is a family winery/restaurant located in the heart of Florence. Those at your table will create fond memories and share lots of laughs over many courses of luscious, traditional Italian fare. The best part of this meal – you don’t have to decide what to order! Your server is an expert on Italian dishes and will provide recommendations for you every step of the way, as well as keep your wine glass filled. Don’t miss out on this special evening of royal treatment! Chianti Excursion – We offer an excursion to a winery located in the Chianti Classico area that was first written about in 1150 AD. The winery is located next to a picturesque castle, which provides a beautiful backdrop for a leisurely day of wine tasting, accompanied by local specialties such as olive oils, traditional almond biscuits, balsamic vinegar, and Tuscan salami. You will be guided to the ancient cellars to see the oak barrels where the wine is aged to perfection. After your winery visit, you will have some free time to explore the small town of Greve. Indulge in a gelato or expertly crafted espresso before exploring the city square. Finish off your day with dinner at a local Tuscan trattoria. Now, go prepare yourself for this incredible experience by renting “Under the Tuscan Sun” to watch while having an Italian-inspired meal. Then, go online to fill out your booking form for one of our upcoming trips that can make your dreams a reality! 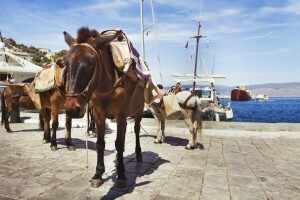 Greek Aquatic Adventures – While on the Island of Poros you will have the opportunity to travel to the island of Hydra. The only form of transportation once on the island besides walking is donkey back; there are no cars allowed on Hydra, which makes the island a unique place to visit! Visit a taverna while on Hydra and sample traditional Greek cuisine, such as tzatziki, dolmadakia, souvlaki, or gyros. Did you know that Hydra has been the location for several popular films? The movies Boy on a Dolphin and The Girl in Black inspired people to begin flocking to the island, which is now a main attraction for tourists visiting Greece. There are many ways to spend your time in Hydra. For a peaceful, relaxing day, pack a picnic and hire a boat to travel to the various secluded bays to have a light lunch and a swim or snorkel session. You can access several of the beaches by foot or water taxi, some which are off the beaten path and others which are near shops, bars, and restaurants. Ever wondered why the water in Greece is so crystal clear? It’s because their beaches are pebbly instead of sandy! While you are with us, we want you to get the most out of your trip. Take a little bit of extra time to enjoy the sights that you came to see in small groups or on your own; there is no shortage of things to do and see in Europe, and we want you to be able to experience as much as possible while on your tour! This entry was posted on Thursday, April 17th, 2014	at 12:45 pm	. You can follow any responses to this entry through the RSS 2.0	feed. Both comments and pings are currently closed.